Any drain or sewage line will need servicing eventually. They tend to become clogged over time and lose their functionality, at times leading to draining issues, which most readers will certainly recognize, as draining issues are extremely common in any household. 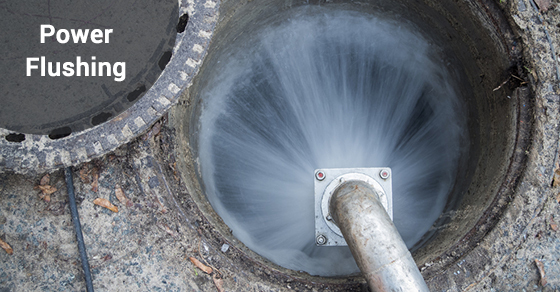 Dirt and other forms of debris often become caught and clogged in drains and sewage lines and will need to be cleaned out. This is not a task for the common household owner and should really be handled by professionals in most cases. Power flushing is a highly effective means of taking care of this very common problem. Power flushing uses water, which is highly pressurized in the machine, to clean the drains and sewage lines. The pressurized water is sprayed through them with a great deal of pressure, so that any debris is blasted away. Power flushing can, of course, be used to flush out your drains and sewage lines. But it is also highly effective in a few other ways. For example, it can also be an effective means of cleaning out radiators, boilers and central heating systems. Power flushing is recommended, on average, about every 5 years or so. This figure, however, factors in a household that has taken excellent care of its drainage and heating systems. Any excessive noise from your radiator is likely another sign that your system would benefit from a power flushing. Water that is failing to heat properly or that is discoloured is also another common sign that you might be in need of this service. Finally, small radiator leaks might also indicate a need for a power flush. Power flushing has many benefits. To begin with, it keeps your system running well and limits the need for further, potentially costly repairs. Additionally, it helps radiators work better, both in terms of heating up quicker and heating your water to a hotter temperature. It can also help the system work more quietly as well. Finally, it can help keep costs down, as a more effective system should cost less in regards to energy bills. Power flushing can be extremely important in maintaining your home heating systems, while ensuring that everything runs well and that you avoid additional costs down the road. Because of this, you should entrust your power flushing needs to a proven and experienced plumber. If you are in need of power flushing, consider Brothers Plumbing, a leader in the industry. Not only do we have over 50 years of experience in plumbing and heating, but we also offer very affordable rates and offer our services seven days a week. Contact Brothers Plumbing today.